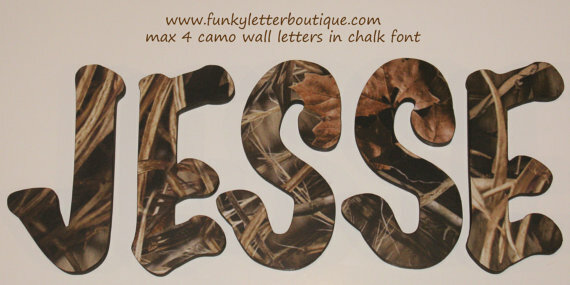 These letters are the cream of the crop to finish off your son's hunting room or nursery! Letters are available in many different sizes from 7"- 16" and are cut from the sturdiest wood available, 1/2 Baltic Birch. You many also choose all capital letters for an additional fee. Letters are done in Max 5 HDCamo (formerly max 4 hd) print. These are hand crafted not hand painted. Chose your font! You can see your name in all the fonts we offer just click font preview tool!.